Most cooks I know have a collection of recipes that they ripped out of some magazine or newspaper with the intention of trying them out some time. I have made it a habit of cleaning those out once in a while, discarding the ones that, if I am honest to myself, I will never ever make. 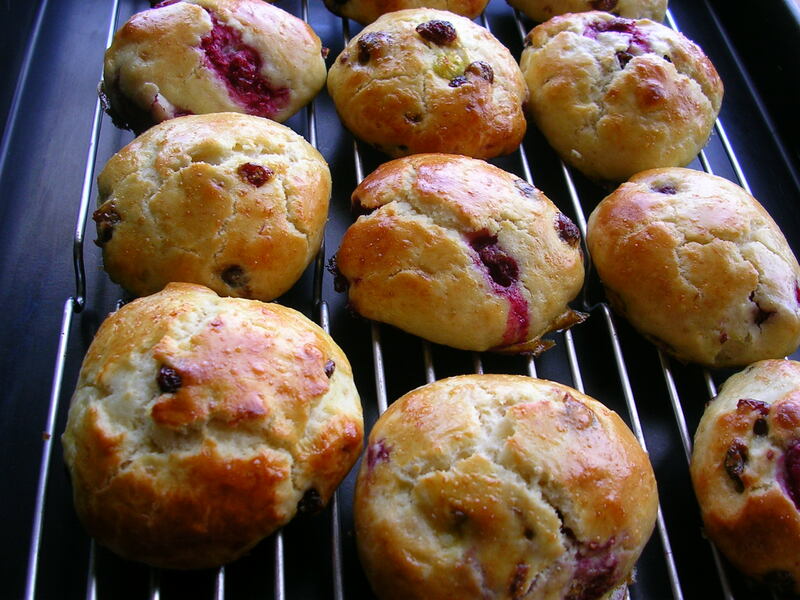 Corby Kummer’s Raspberry-and-Raisin Tea Scones from The Atlantic were on their way out. I am not sure whether it was that the recipe calls for the flour being sifted five times (I usually never sift flour), or that I could not warm up to the combination of raspberries and raisins. But because I have frozen raspberries from the garden, and I seriously need to start cooking and baking my way down our overfilled freezer, I gave the recipe a try. However, I made a few changes. I used dried cranberries instead of raisins, and canola oil instead of olive oil. As the dough was a sticky mess, cutting was difficult. So I ended up shaping the scones by hand, but I did this very quickly, so that the consistently would not become too dense – why, otherwise, would I have sifted the flour five times? I find the result yummy – light and with a subtle sweetness, so you can still put jam or jelly on them. Now I am waiting to hear what my family tasting panel says. 1. Sift the flour five times into a large bowl. Mix with the baking powder and salt. 2. Whisk the buttermilk with the canola oil, sugar and 1 egg in a small bowl. 3. Add the liquids to the flour mixture and quickly work it in with a spatula until the dough holds together. Fold in the cranberries Do not overwork the dough. 4. Preheat the oven to 500 degrees F. Line a large baking sheet with parchment paper. 5. Place a large piece of wax paper on the counter. Put the dough in the middle of it and place another sheet of wax paper of the same size on top. Pat the dough with your hand to an equal thickness, about the size of letterhead paper. 6. Peel off the top layer of wax paper and sprinkle the individual raspberries over half of the dough. Fold the other half of the dough over it. 7. Place the top wax paper on top of the dough gain and flatten the dough slightly. 8. Remove the paper and cut the dough into 12 to 14 equal pieces. 9. With floured hands, quickly and lightly shape round, about 3-inch scones, taking care not to compress the dough. 10. Place the scones on the prepared baking sheet about 2 inches apart. Whisk the remaining egg and brush the scones with it. 11. Place the baking sheet into the freezer for 10 minutes. Remove the baking sheet from the freezer and brush the scones again with the egg wash.
12. Put the baking sheet in the oven and reduce the temperature to 425 degrees F. Bake for 18 minutes. Remove from the baking sheet immediately and cool completely on a wire rack. Stick around your master when he/she is eating these scones. The crumbs are worth it. Eat straight. No butter needed, damn. I suspect the Food Police make them this moist and deliciously smooth (keep on sifting) to keep me out of the butter dish.